Can you identify any of the men in this photograph? 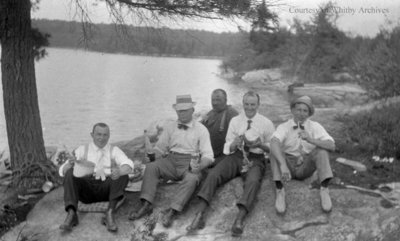 A black and white medium format negative of an unidentified group of five men sitting on a large rock with a lake in the back ground. This negative has started to degrade. Unidentified Group of Five Men, c.1915, Photographer Unknown. Whitby Archives A2014_001_027.